Amori is a very elegant shape, we are doing this shape for many years, it is a total success since the first day we cut our first batch, our regular customers buy it many times because the great meal they accomplish with it. Kids love short pasta because it is easy for them to grab, it is fun and the cork screw like shape in the Amori Fresh Pasta is very attractive too. Preparing Amori Fresh Pasta with a sauce this shape allows the sauce to get inside of the shape, making a very savory bite. You can make great pasta salads. This particular picture of the Amori Fresh Pasta in three color has roasted sweet red pepper, garlic and fresh parsley that has very attractive color too and it is very inviting to the eye plus the smell makes an extraordinary choice. At home we use it a lot, once it is cooked we add it to a stew right before we serve to keep the pasta “al dente”.When we cook it we take it before is totally “al dente” so we can add it to meals. If we are serving it as a main course we cook it all the way to “al dente”. Usually, we cut this Fresh Pasta Amori shape plain, with basil and garlic, sun dried tomato and garlic, sweet roasted red pepper garlic, parsley and garlic, lemon pepper and lemon parsley. All of those are the most common flavors we like to use for this shape. 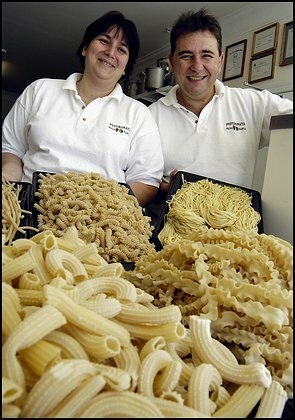 Love your pastas! When I make a carbonara, I use just the yolks so have to use more eggs. Keep up the great work! Next, I'm going to try your ravioli! I'm sure they'll be wonderful! Thanks Mike for writing in my blog, it really means a lot to us, I am sure you will love my raviolis too.